At this point, you have a database called dev and you are connected to it. Next, you create some tables in the database, upload data to the tables, and try a query. For your convenience, the sample data you load is available in an Amazon S3 bucket. If you're using a SQL client tool, ensure that your SQL client is connected to the cluster. After you complete this step, you can find more information about Amazon Redshift and reset your environment at Where Do I Go From Here?. Copy and run the following create table statements to create tables in the dev database. For more information about the syntax, see CREATE TABLE in the Amazon Redshift Database Developer Guide. Load sample data from Amazon S3 by using the COPY command. We recommend using the COPY command to load large datasets into Amazon Redshift from Amazon S3 or DynamoDB. For more information about COPY syntax, see COPY in the Amazon Redshift Database Developer Guide. The sample data for this tutorial is provided in an Amazon S3 bucket that is owned by Amazon Redshift. The bucket permissions are configured to allow all authenticated AWS users read access to the sample data files. To load the sample data, you must provide authentication for your cluster to access Amazon S3 on your behalf. You can provide either role-based authentication or key-based authentication. We recommend using role-based authentication. For more information about both types of authentication, see CREDENTIALS in the Amazon Redshift Database Developer Guide. For this step, you provide authentication by referencing the IAM role that you created and then attached to your cluster in previous steps. If you don't have proper permissions to access Amazon S3, you receive the following error message when running the COPY command: S3ServiceException: Access Denied. The COPY commands include a placeholder for the Amazon Resource Name (ARN) for the IAM role, as shown in the following example. To authorize access using an IAM role, replace <iam-role-arn> in the CREDENTIALS parameter string with the role ARN for the IAM role that you created in Step 2: Create an IAM Role. Your COPY command looks similar to the following example. To load the sample data, replace <iam-role-arn> in the following COPY commands with your role ARN. Then run the commands in your SQL client tool. Now try the example queries. For more information, see SELECT in the Amazon Redshift Developer Guide. -- Get definition for the sales table. -- Find total sales on a given calendar date. -- Find top 10 buyers by quantity. -- Find events in the 99.9 percentile in terms of all time gross sales. 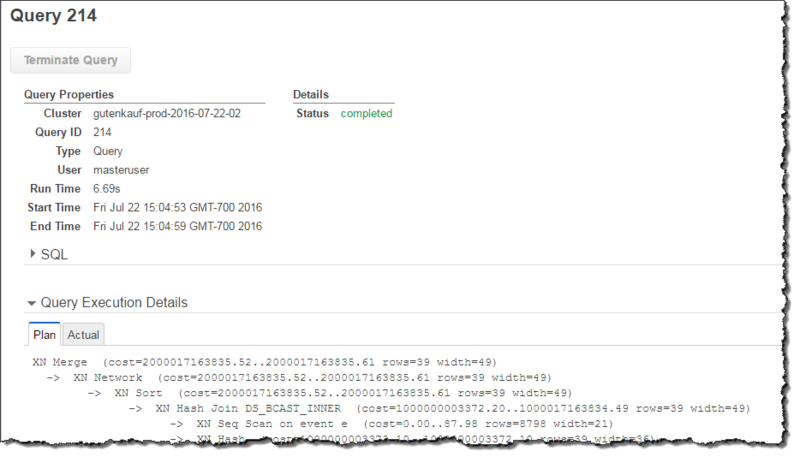 (Optional) Open the Amazon Redshift console to review the queries that you ran. The Queries tab shows a list of queries that you ran over a time period you specify. By default, the console displays queries that have executed in the last 24 hours, including currently executing queries. In the cluster list in the right pane, choose examplecluster. The console displays list of queries you ran, as shown in the example following. To view more information about a query, choose the query ID link in the Query column or choose the magnifying glass icon. The following example shows the details of a query you ran in a previous step.